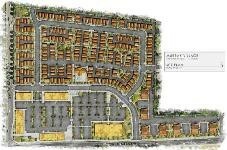 The seven acre, 104 lot townhouse project has three open space tracts, pedestrian pathways and alleyways. The majority of the units are alley loaded providing an attractive streetscape. One open space tract is located in the central portion of the site and includes feature landscaping, play areas for tots and older children, pathways and benches. This open space also serves as a greenway upon which some of the homes front. The other large open space along the southern boundary of the site is designed for both passive and active uses as well. Part of it preserves the Significant Natural Resource areas. The remainder includes a gazebo, benches, picnic tables and a pedestrian/bicycle pathway circulating along the rear yards and back out to the street. The twenty seven acre mixed use development contains 220 single family detached homes, 140 condominium units and 115,000 square feet of commercial development. The single family homes are based on a “common green” design with units that are alley loaded and fronting onto open space areas. This creates a network of open space punctuated by larger open space areas with active amenities such as playgrounds, grassy open areas and a clubhouse with a pool and outdoor fireplace. The different housing styles, multiple open spaces, attractive pedestrian environment and various site features and amenities, and commercial component make this a unique environment for modern living. 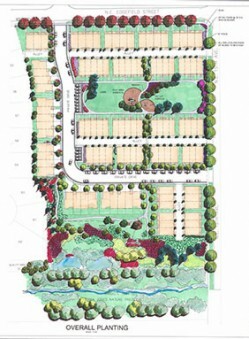 This 305 lot, sixty five acre development was designed as a Planned Unit Development distributing densities throughout the site into four distinct neighborhoods. 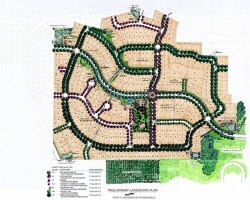 The lots range in size from 4,400 to 9,000 square feet. Pacific Crossing is a well thought out community and incorporates passive and active recreation uses to create an attractive living environment. The meandering sidewalks, parkways, central intersection, narrow local street intersections, bump outs, cobblestone stamped crossings, waterfall, stone entry walls, pool, community room, play areas, sport court, picnic tables, interpretive sign, pathways, monuments, preserved trees and intensive landscaping create a place people will be proud to live and recreate. A nine acre transit oriented apartment development contains 243 units in 10 buildings. Various active open spaces and a large natural open space were incorporated into the plan to provide recreational opportunities. The active uses consist of a clubhouse, pool and tot lot. The design brings the buildings to the street frontage for an urban concept which in turn relegates parking to the interior of the site preserving the streetscape aesthetics.